One of the touchstone quotations in Franco Moretti’s work on distant reading is a line from the composer Arnold Schoenberg, which Moretti seems to have encountered in Theodor Adorno’s The Philosophy of Modern Music. It’s a repudiation of middles, and it goes like this: “The middle road . . . is the only one which does not lead to Rome.” In Moretti’s “Modern European Literature: A Geographical Sketch” (1991), Schoenberg’s claim helps set up a series of polarizations within modernism—James Joyce and Franz Kafka, T. S. Eliot and Rainer Maria Rilke, Pablo Picasso and Wassily Kandinsky, Marc Chagall and Paul Klee, Igor Stravinsky and Schoenberg himself—as a way of asking what causes those polarizations. Part of Moretti’s response is that by the turn of the twentieth century, what he calls the “middle way of realism” can no longer represent the Other of Europe, much less the Other in Europe, and is abandoned in favor of two extremes: mass-cultural genre fiction on the one hand and modernist experimentation on the other. The Schoenberg quotation appears again, at the end of Moretti’s “The Slaughterhouse of Literature” (1995), but by this point its function has shifted from historical shorthand to methodological slogan. Given both the massive tree of literary possibilities and the unanswerable question of what will count as knowledge in our field in ten years, we must cultivate, says Moretti, a “radical diversity of intellectual positions” in order to compete with “a maximum of methodological boldness” for the scarce resources within our ecological niche (Moretti, Distant Reading, 89). The middle road, he implies, leads not to Rome but to stasis, irrelevance, and extinction. Fig. 1. 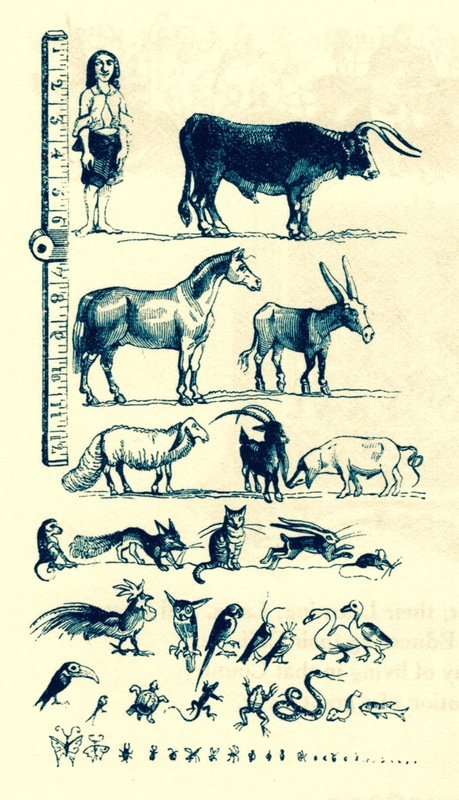 Comparative sizes of the inhabitants of Lilliput and animals, illustration from Gulliver's Travels into Several Remote Regions of the World, 1842, by Jonathan Swift, with drawings by J. J. Grandville. At issue here are extremes of degree or intensity rather than of scale. And I have no quarrel with Moretti’s injunction to test the outer limits of our methodologies, to mount “a permanent intellectual challenge to national literatures,” or to say, with Stendahl in the quotation Moretti uses to tie off his “Conjectures on World Literature,” “Don’t delude yourself...for you, there is no middle road” (62). But of course these repudiations of the middle occur in work that undertakes and advocates a rotation toward two scalar extremes: toward the macro, in the shape of quantitative approaches to large literary corpuses; and toward the micro, via topic modeling keyed to particular stems, terms, titles, devices, and the like. So when Moretti censures the middle degree as the way of diplomacy, compromise, failure of nerve, and genuflection to norms, we’re meant, I think, to hear a censure of the scalar middle as well. Not that many of us need encouragement in middle-avoidance. Who, in addressing the scale of literary analysis, wants to talk about the middle, or to avow that they work in middle scales, much less to write a manifesto for what social scientists call meso-analysis? The middlebrow, sure, and the middle class—these are the uses of the word one typically finds in our book indexes and conference programs. But when it comes to the magnitude of our analytical objects, the middle is the scale that dare not speak its name. And not, I submit, because it’s taboo or untraversable but because we think we spend most of our time there as it is, and that what it means to work at middle scales is so self-evident as to require no elaboration. The middle, we seem to have concluded, is too basic to name or to theorize, much less to champion. Insofar as our discussions of scale rush toward the sexier extremes of macro and micro, the still populous meso gets defined, to the extent it’s defined at all, weakly and through negation: the meso is just whatever isn’t explicitly designated macro or micro. But accepting this vague sense of what the middle isn’t means we don’t trouble to say, more tangibly and emphatically, what isn’t the middle, what isn’t in the middle, and why. And consequently we don’t have a strong notion of what the middle is, what it includes, how it works, and what it does. Yet even as the double rotation toward macro- and micro-analysis turns the meso into an inert default, it also productively relativizes the middle as a default—that is, as a strong predisposition to which there are, nonetheless, alternatives. The middle stands revealed, increasingly, as a middle rather than as the full compass and extent of our work. Playing on what used to be the whole instrument but now looks like a single octave on a larger keyboard—the Casiotone that became a concert grand—we realize that despite having spent most of our time in this middle, we don’t have an analytical theory of it at all, much less one that reflects the turns to micro and macro. I am not the person who can offer a full-blown theory of humanistic meso-analysis. Such a theorist, when they arise, will baptize the middle with fire. In my aqueous way, however, I wish to offer a few draft points toward a manifesto for what I’ll christen, for now, the medial humanities. 1: Call the middle by its name. If the tendency of meso-analysis to go without saying contributes to its undertheorization in the humanities, the first step in rendering it theorizable—which is to say visible for examination, framing, and disputation—is to find a language for saying that’s in fact what we’re doing. What might change, we should be wondering, if instead of continuing unselfconsciously to work at the scalar interface between abstract theorizing and individual case studies, we called that work meso-analysis? We might do this in our teaching as well. By engaging directly in meso-analysis, a course entitled “The Modernist Long Poem” in which only a dozen such poems were assigned could turn its title and reading list from a pat metonymy into a problem to be addressed head on—a problem involving questions of analytical scale, set criteria, and exemplarity. Even in mid-discussion, flagging a change in analytical scale (from micro to meso, say) would allow students to consider what modes of reading are most conventional and most effective at different scales. Such a practice might also usefully curb one’s habit—okay, my habit, and maybe yours as well—of casually extrapolating from the evidence in one or two works to a claim about a whole genre, mode, or period, as if one could assume a smooth scalability from micro thru meso to macro. 2: Don’t assume smooth scalability from micro thru meso to macro, or vice versa. Far from being some mealy and savorless expanse between micro and macro, the meso, we can say, is the scale that mediates between those two extremes. We can also say, with the sociologists, that middle-range analysis integrates theory and empirical research, case histories, and their humanistic isomorphs such as close reading. But those words mediate and integrate, particularly the latter, can imply a scale sliding frictionless, or the evenly spaced rungs on a straight ladder (ladder being, after all, the object whose Latin name, scala, gives us the word “scale”). Such an assumption of smooth scalability is cherished by capitalism—particularly, as Laura Finch has shown, by finance capital. But a whole range of factors—from the laboring and desiring body to scarce resources to imperfect information—can turn the middle into a zone of friction, amplification, ideological filtration, recalcitrance, and unpredictability. We need a better understanding of the middle scale’s capacity to interrupt or efface rather than to hold open; to harbor discontinuity rather than to be the quintessence of continuity. To be, as a ladder, curved, or broken, bunched or stretched in such a way as to compress or distend its units, interfering with the assumption that micro phenomena scale up arithmetically, or even logarithmically. Fig. 2. 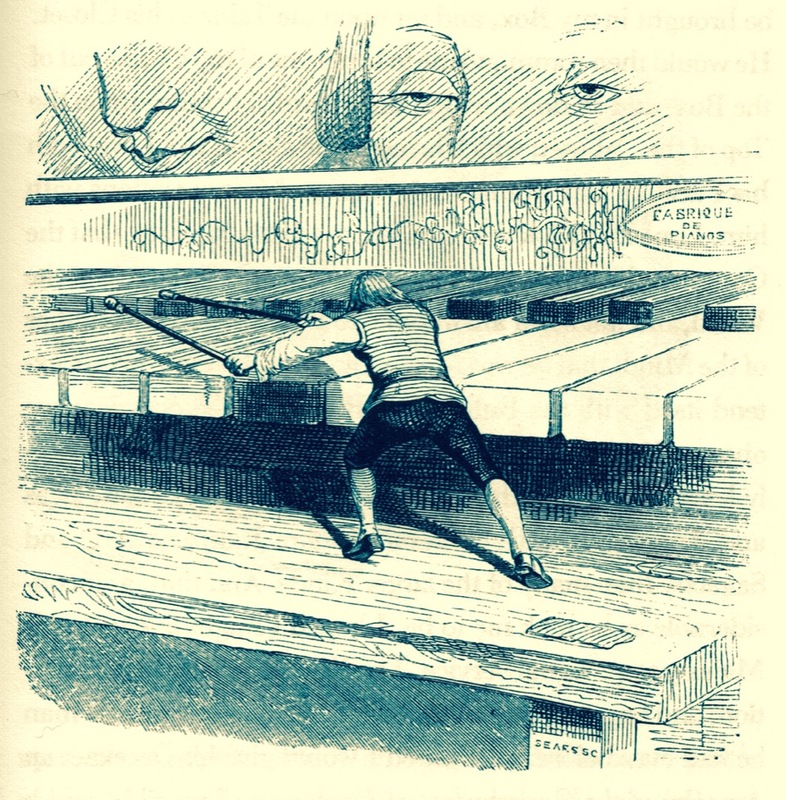 Gulliver playing the spinet, illustration from Gulliver's Travels into Several Remote Regions of the World, 1842, by Jonathan Swift, with drawings by J. J. Grandville. 3: Don’t be afraid to start with other disciplines on the analytical middle. As modernist studies and its participant disciplines engage more and more with environmental questions, it will be surprising if our scalar models and imaginaries aren’t informed by contact with both the environmental sciences and the environmental humanities. Not informed in simple or monovalent ways, of course. The techniques of predictive climate modeling, to take an obvious example, may be of limited direct applicability to how even quantitative humanists model the uptake of words or the dissemination of works. But in a more general sense, the study of climate change poses urgent questions about connections between tangible micro behaviors and planetary-scaled macro effects. In the study of those connections, the middle scales are of intense concern, being the region where micro gestures aggregate and are amplified or dampened by other aggregate forces in bogglingly complex feedback systems. The challenges entailed in modeling and representing the scalar middles of complex systems have already begun to prompt new questions about how cultural works are both sites of and inputs into climate modeling. At the same time, practitioners of global environmental assessment are discovering something humanists have known for a long time: that bridging multiple analytical scales also means—and should mean—bridging multiple epistemologies. 4. Consider ways in which the humanities might be understood as the medial discipline par excellence. “[L]ocal in its analysis of circumstance, and large-scale in its recognition of the common workings of certain general factors”: Daniel Little’s description of mesohistory may work pretty well, after all, as a place to begin characterizing the humanistic middle. In the end, we may come to understand (rather than reflexively to practice) the humanities as the discipline of the middle—of mediation rough and smooth, of ladders torqued, snapped, and taffy-like. As the median between untestable macro statements and incontestable micro ones; as the region of conjuncture and contingency between macro’s determinist bent and micro’s devotion, variously, to granular causalities, hidden frictions, curiosities, and accidents. Humanistic mesoanalysis may turn out to be the zone where neither presentism nor positivism can sustain the fantasy that it will dominate while the other disappears—where each must be uneasily responsible to the truth of the other. I’d like to end by observing another set of sites where middle scales are being crucially rethought and recathected. These are political responses to nativist nationalism’s recent resurgence. In the United States, the shock felt by many on the left was partly the result of assumptions about the smooth scalability of the micro up to the macro. For many of us, the signs in our various political microclimates, whether these were professional, residential, or online, were not only clear in indicating a Democratic victory but also in step with what the pollsters, poll aggregators, betting markets, and other sites of macroanalysis were telling us. We can narrate what happened in the 2016 election in many ways. But surely one of them is as a radical disappointment of smooth scalability by the analytical mid-range—in this case, the range of municipality, county, region, and state. Many of those around me, at least, are registering this in their subsequent turn away from both social micro-ecologies and national politics, and toward the middle-scaled communities named above. We’re beginning to realize we had either a bad meso-theory or none at all. We’re beginning to re-think and re-occupy the analytical range that broke the force of our assumptions: the volatile, critical middle. Pace Moretti, Adorno, and Schoenberg, the middle road need not lead to Rome to be worth taking. Theodor W. Adorno, Philosophy of Modern Music, trans. Anne G. Mitchell and Wesley V. Blomster (New York: Continuum, 2004), 3. According to Adorno, Schoenberg’s comment is found in the Foreword to his Three Satires for Mixed Chorus [opus 28, nos. 1–3]. Franco Moretti, Distant Reading (London: Verso, 2013), 32. See Laura Finch, “Personal Finance: Economic Citizenship and Financial Form in the Contemporary Novel,” PhD diss., University of Pennsylvania, 2016; see, especially, chapter four. Daniel Little, New Contributions to the Philosophy of History (New York: Springer, 2010), 93. See, for example, “Realism after Nature: Reading the Greenhouse Effect in Bleak House,” in Jesse Oak Taylor, The Sky of Our Manufacture: The London Fog in British Fiction from Dickens to Woolf (Charlottesville: University of Virginia Press, 2016), 21–43, for a reading of how Dickens’s multiplot fiction engages in its own downscaled climate modeling. See, for example, Clark Miller and Paul Erickson, “The Politics of Bridging Scales and Epistemologies: Science and Democracy in Global Environmental Governance,” in Bridging Scales and Knowledge Systems: Concepts and Applications in Ecosystem Assessment, ed. Walter V. Reid, Fikret Berkes, Thomas Wilbanks, and Doris Capistrano (Washington, DC: Island Press, 2006): 297–314.